Hyperthermophilic pretreatment (80 °C, 24 h) is a technology that promotes methane yield in the anaerobic digestion of sewage sludge. However, little information is available on the characteristics of sludge anaerobically digested with hyperthermophilic pretreatment as a fertilizer and on the environmental impact of using the sludge as a fertilizer. 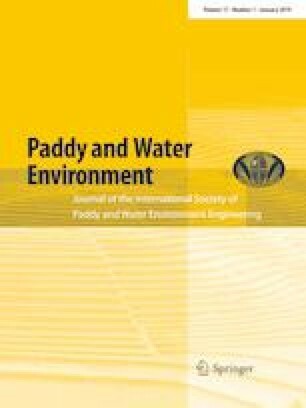 In this study, we conducted incubation experiments to examine the characteristics of methane production and nitrogen mineralization in paddy soil treated with sludge from anaerobic digestion that was enhanced by hyperthermophilic pretreatment. Sludge samples digested under 15, 25, 30 and 35 °C with and without hyperthermophilic pretreatment were used. Sixty-mL vials were used in the experiment. Each vial was filled with 5 g of air-dried paddy soil, 10 mL of degassed water and digested sludge. It was then covered with a butyl rubber stopper, its headspace air was replaced by N2, and it was incubated at 30 °C. Methane concentrations in the headspace of the vials were measured after 7, 14, 28, 46, 57, 70 and 84 days. NH4-N concentrations in the soil were also measured after 0, 14, 28 and 84 days. The results indicated that relatively more methane tended to be produced in soil treated with sludge from anaerobic digestion that was enhanced by hyperthermophilic pretreatment than in non-pretreated sludge. On the other hand, a small amount of NH4-N was released from sludge digested with hyperthermophilic pretreatment at all digestion temperatures because organic nitrogen had been decomposed under hyperthermophilic pretreatment. Therefore, the appropriate application rate of sludge digested with hyperthermophilic pretreatment can be determined based on NH4-N in digested sludge without consideration of nitrogen mineralized after application when the sludge is used as a fertilizer. This work was supported by the Osaka Bay Regional Offshore Environmental Improvement Center and JSPS KAKENHI Grant Number JP17K18349. We would also like to express our gratitude to the WWTP for providing sludge for this study.